Why put the plans up for free? Benjamin Grosser is an artist and a professor at the University of Illinois. See his website for more about his work. This website has garnered many favorable reviews, from the formal to the informal. The highlight of these blurbs was a favorable review in the June 2000 issue of Art Calendar magazine. It has also received favorable mention in various artist newsletters (i.e. Studio Notes), artist websites (i.e. WetCanvas) and numerous woodworking plan sites on the web. With a bit of Googling you can find much discussion about this design, including mods and improvements. Big pre-made easels are expensive! I preferred to build my cheap one and spend the savings on paint. After I designed and built the first one, I drew up the plans and posted them here. I benefit daily from information that others have posted on the web for free. This includes information that helps me in my work, life, and health. I would prefer to see this information stay free, and one way to promote my perspective is to practice it. I am also very encouraged by correspondence from those who have built one or those who plan to. Pictures of finished easels are especially welcome. 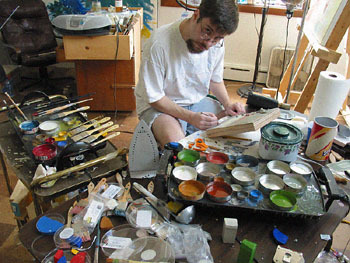 There have been several easel plans for a fee posted to the web over the last few years. Some are still up now. These may or may not be any good--I've never bought one. However, I can't help but figure I've not done their business much good. In fact, I'll never forget (try though I might) when I once received a very nasty email from a woman I had sent an email to asking her to list me on her 'links to other artists' page on her website. Turns out she was the publisher of a small press that had just put out their own book on a studio easel plan. She claimed my plan was flawed because I didn't use hardwood, didn't finish the easel, nor did I give a history of general woodworking. Sounded to me like she was looking to make a few bucks and was unhappy I wasn't. I was also obviously more interested in helping artists without much money (giving them plans for free and suggesting they use low-cost materials). She ended by saying I was giving out really bad advice and that my easel would fall apart in the near future. Needless to say, her book went out of publication a few years ago. My easels are still doing as well as the day they were built (one of them was built in 1998!). I'm no longer painting (in fact, my last painting project was making a robot to paint for me). Visit my projects page to see my work in other media. I invite correspondence from anyone who has questions about the design. It sometimes take me a while to get back, but I will write back if you ask me to. I also love to get appreciative emails as much as the next person (see the gallery for some examples). For some reason, positive emails regarding this site have more than once functioned as a bright-spot to an otherwise difficult or stressful day. Send emails to grosser(NOSPAMat)bengrosser.com (replace the (NOSPAMat) with the @). I can accept image attachments (of easel photos of course) at this address.